If you’re a long-time astrobites reader with interests that extend to the fascinating and vibrant field of particle physics, you’ll love the work being published at our sister site particlebites. Like astrobites, particlebites authors are graduate students that cover the latest research in their field, particle physics, by posting concise and engaging summaries of newly published research and preprints. Below is an excerpt from a post by particlebites guest author Chris Karwin. 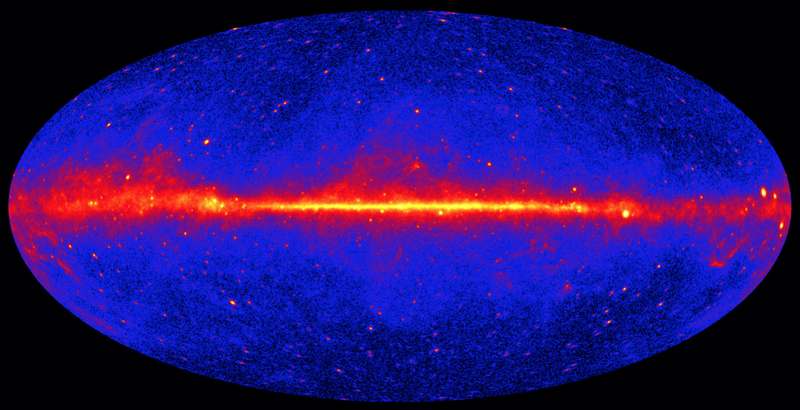 All-sky counts map of gamma-rays. The color scale correspond to the number of detected photons. Image from NASA. What makes the excess so interesting is that its features seem consistent with predictions from models of dark matter annihilation. Read the full article on particlebites at this link.